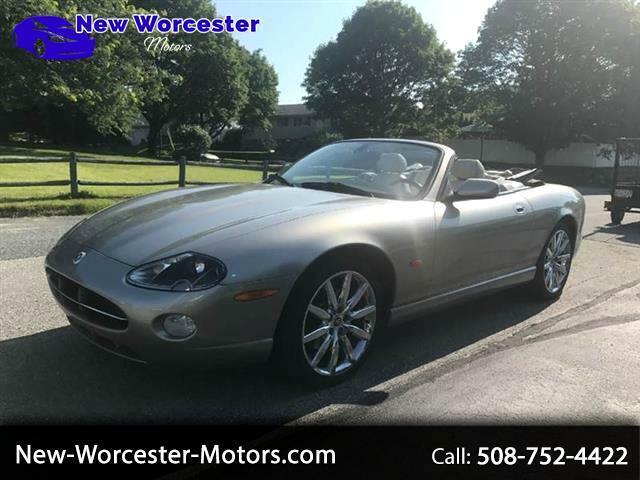 This 2006 Jaguar XK8 is in excellent condition inside and out. With only 78K miles, this vehicle is a rear find in this condition. It's equipped with Tan Leather Seats, Navigation, Power Top, Alpine and upgraded the Chrome Appearance Package. Visit New Worcester Motors online at new-worcester-motors.com to see more pictures of this vehicle or call us at 508-752-4422 today to schedule your test drive. The advertised price does not include any state sales tax, vehicle registration fees, finance charges, documentation charges, and any other fees required by state or federal law. This disclaimer is to state, that any and all information provided by said dealer is to the best of dealer’s knowledge, to be accurately disclosed. It is the Consumers responsibility to verify the model and equipment listed in our adds. Said dealer assumes no responsibility for any errors or omissions incorrectly. Any Vehicle history information listed prior or after to the ownership of the New Worcester Motors may be inaccurate, and New Worcester Motors assumes no responsibility for said inaccuracies, damage, or repairs. Any used vehicles sold at New Worcester Motors will carry the Mass State Lemon Law warranty and the dealer will uphold any obligations required by Massachusetts state regulations. The dealer has three (3) attempts per specific problem to repair any state required issues needing to be addressed. There will also be a $100.00 deductible charge paid by the customer to the dealer for each repaired item unless otherwise agreed to in advance. Anything not agreed to in writing, prior to the sale, will not be repaired/replaced/provided unless required by the Massachusetts State Lemon Law Warranty and will carry the $100.00 deductible to be charged to the customer. We allow all our customers the right to have a third party inspect the vehicle at the customer’s expense prior to purchase for their own personal reassurance. Message: Thought you might be interested in this 2006 Jaguar XK-Series.